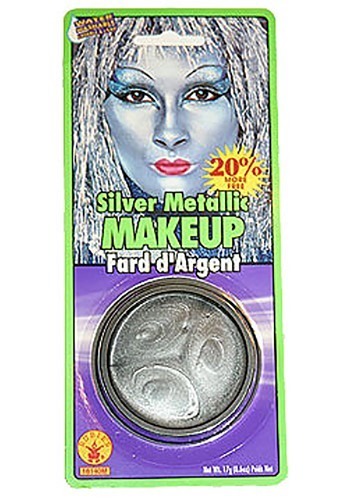 If you only had a heart and this Tin Man Face Makeup your life will be complete! Get ready for an Oz-like adventure with this fantastic crème makeup. With a face full of silver, you'll be ready to hop, skip, and dance down the yellow brick road, off to see the wizard, the wonderful wizard of Oz with your jolly crew of Oz misfits! Finally, transforming yourself into a man made of metal has never been so simple! With an easy to apply and easy to remove metallic face makeup you will soon be the perfect replica of Dorothy's right hand man! Our tin man makeup will stay put all night. Don't forget to bring your oil can along so you can move freely throughout the night without those unnecessary squeaks. Get together with Dorothy and the rest of the gang, but be aware of all the wicked witches that might be lurking out there.